Two-piece glassless 110 Pocket Instamatic format mask set for use with the Omega D5500 carrier cassette system. 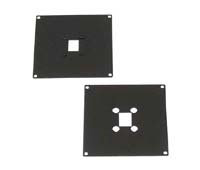 This mask set must be used with the #423-950 C-size Negative Carrier Holder. These masks are used but are certified to be in perfect working condition.